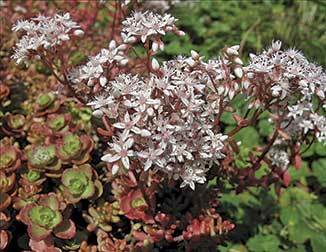 Sedums are often taken for granted in our gardens. Maybe it’s because they don’t bloom till late summer or autumn, but more likely it’s because they are so easy to grow. Remarkably hardy, their thick, succulent leaves are able to withstand drought, rain and temperatures of -10 degrees Celsius. By dying down to a base rosette in winter they are protected from harsh conditions. There are more than 400 species of sedum – a vast array of plants with various habits – prostrate, creeping, pendulous, upright and arching. Some species, such as Sedum acre creep between rocks, resembling moss (this has led to the common name of stone crop) and others like S. morganianum spill and dangle from baskets. The real star of the genus, however, has a name that says much about its appearance – S. spectabile – spectabile meaning showy or striking. Sedum spectabile originates from China, where its fleshy leaves were once valued as a food source. It was also believed to provide protection against fire, and plants were commonly grown in pots on the roof. Reaching between 45-70cm high, S. spectabile’s succulent, greyish-green leaves are whorled up a stout, fleshy stem which is topped with a large, rounded and somewhat flattened cluster of small, bright florets – looking much like a flashy head of broccoli. The flower heads are held into winter, when it dies back to its basal foliage. Flower colour ranges from pale lilac-pink through to brick-red “Autumn Joy” and the ruby-red “Purple Emperor”, which has dark mauve-purple leaves. The white-flowered S. alboroseum “Frosty Morn” has variegated foliage, with a thin, cream margin edging a blue-green leaf. It gives the plant the appearance, true to its name, of being covered in frost. S. telephium “Munstead Red” has purple-black stems and large, flowering heads of a deep russet red. Like S. “Matrona” it has bold structural appeal, and combines well with Phorium tenax (New Zealand flax) “Purpureum” and grasses like Calamagrostis x acutiflora (reed grass) and Festuca glauca (blue fescue). Propagation of sedums can be by seed, division or cuttings during summer and autumn. Seed, however, can be variable, so the first two methods are preferable if it’s a hybrid or cultivar, and you want to continue those characteristics. Clumps should be divided every three to four years to prevent crowding and to reintroduce vigour – it should also give you a better floral display. 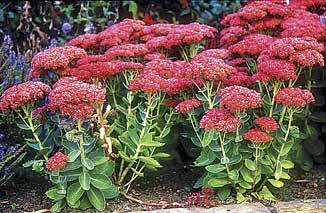 Sedums like a sunny spot, and are generally trouble-free. Their fleshy leaves however can become susceptible to slugs early in the growing season, and “Purple Emperor” has a slight problem with white fly, but this can be overcome by spraying with Neem Oil. Try planting your sedum in a spot easily viewed from a comfy chair on your deck, or from inside. Sedums are irresistible to bees and butterflies and quite a show is created as they dance for the nectar.